Comments on any aspect of the practice are always welcome. 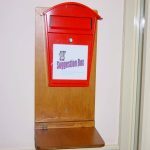 If you have any suggestions or are unhappy about any aspect of our service, write them down and drop them in our reception box in reception. We take concerns about our service and complaints very seriously and are very keen to work with you to resolve issues as soon as we can. If you wish to make a formal complaint against us, we operate the NHS complaints procedure: any letters of complaint should be addressed to the Practice Manager. A leaflet outlining the procedure in more detail is available from the link below. To listen to the information on our complaints procedure, please click here. A general leaflet is also available on how to make a complaint about an NHS organisation, which is published by NHS England, is available from the link by clicking here.